Imagine the power! If you could wield the immense force of the Death Star, you could proclaim yourself the ruler of the galaxy and no one could stop you (except maybe a small ragtag group of rebels). You could control the entire galaxy with an iron grip and every planet would be forced to comply with your set of rules. You could be the supreme Emperor! This officially licensed Star Wars tote has a circular shape and the Death Star painted onto the top of it. It comes with a plastic handle on the top and a metal clasp to keep the lid secure. This thing might not house advanced plasma weapon technologies in it, but it can hold a sandwich and some snacks, which are much better than giant laser weapons anyways. 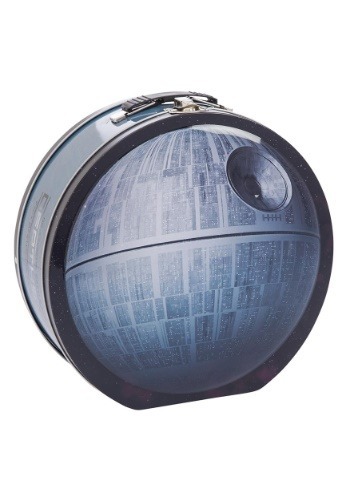 If you’re looking for an intimidating lunch box that will help you gain authority in the lunchroom, then this Death Star tin tote is the go-to lunch box for you!